Since we moved in back in November 2012 we have slowly done things to certain rooms of the house, but it has taken time and means that we have never ever got to Leo's bedroom. When we were living with my parents Leo had a lovely room decorated especially for him, blue walls for my blue eyed boy and it truly felt like Leo's room. It was a such a nice room to just sit in, but his room here has never really felt truly his. I detest the yellow/lime green colouring, but just can't justify painting it all while we are renting. I felt like his room was destined to stay bland and by far my least favourite room in the house. 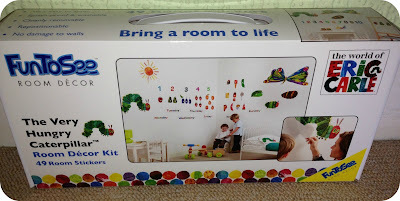 We were recently sent The Very Hungry Caterpillar Room Decor Kit to try and breathe some life and personalisation into my little man's room. We have always loved The Hungry Caterpillar and often read the book, little Leo even has the DVD so I knew that he would love this addition to his bedroom. There are 49 stickers in total within this set, and they are a really great size in fact I was surprised at just how large some of them were. 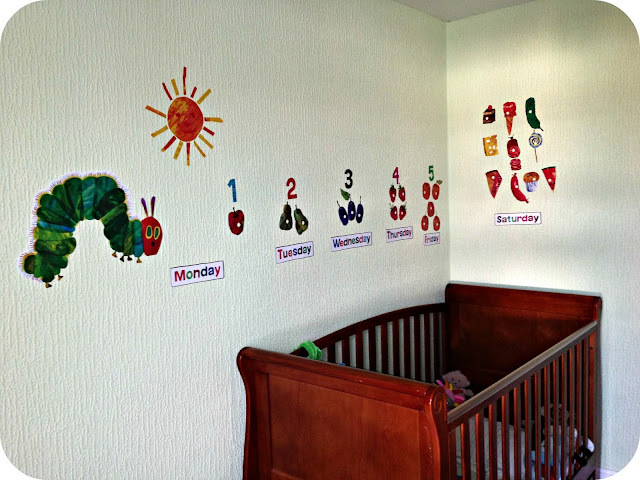 The stickers tell the story of The Very Hungry Caterpillar as he eats his way through each of the food his discovers throughout the week, making his transition into a beautiful Butterfly. 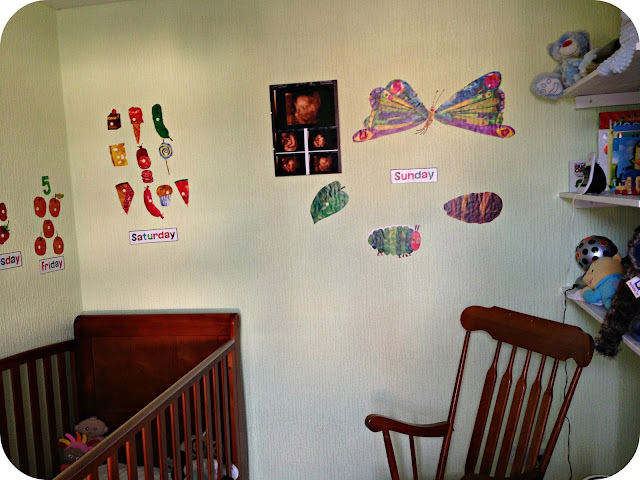 The stickers fill the bland walls perfectly and have stuck really well to the wall. I was a bit worried that they may peel off as Leo's wall is actually wall papered in that very annoying bobbly paper. I have had to push some of the stickers back down firmly from time to time where they have come back up, but if they stick to Leo's wall like they do, then on a flat bedroom wall there will be no problems at all. The actual quality of these sticks is second to none, I have used wall stickers in the past that have torn as soon as I have tried to take them from the sheet but I haven't experienced this with these stickers once. When I was applying the stickers I had to remove some of them to get them lined up properly, but they still stuck back down perfectly, so you do have some leeway with re-arranging them if you need to pull them back up for any reason. As you can see they have really made this room more than just a room that Leo sleeps in, they have given it that mark to say that 'This room is Leo's!' and he has been loving pointing out the big fat Caterpillar to me as we go in for nap time and off to bed at night. I think this set of stickers is great, either for the finishing touches to a room you have decorated or for families like me who are renting and cannot justify decorating the entire room for one reason or another. The Very Hungry Caterpillar Sticker Set retails at £28.00, which is an absolute bargain for the size and quality of these stickers. I love how they have brightened up the dullest room in the house and given Leo something visual to look at. 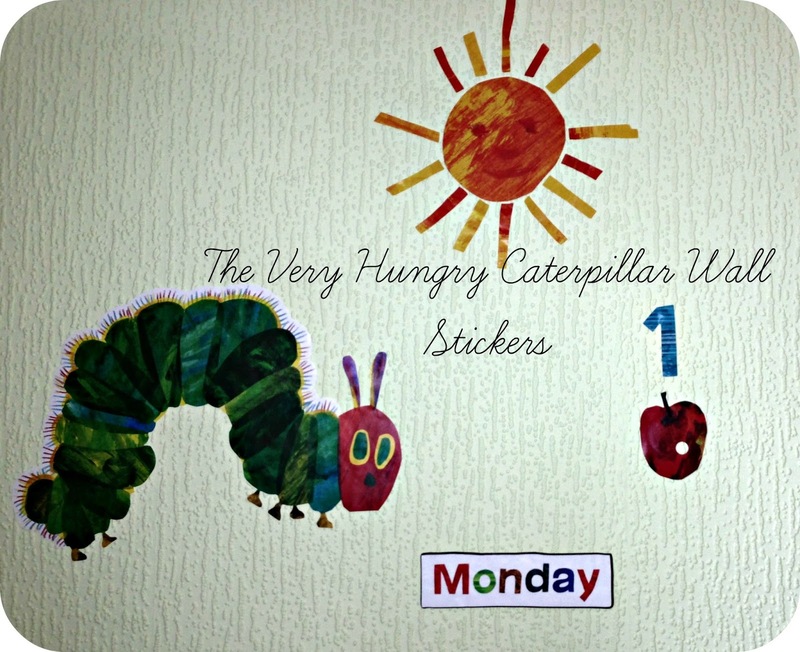 Disclaimer: I was sent The Very Hungry Caterpillar Wall Stickers for the purpose of this review. I have expressed my own personal experience with this set and everything expressed above is true to life.